Khloe Kardashian was staying close to family this week. 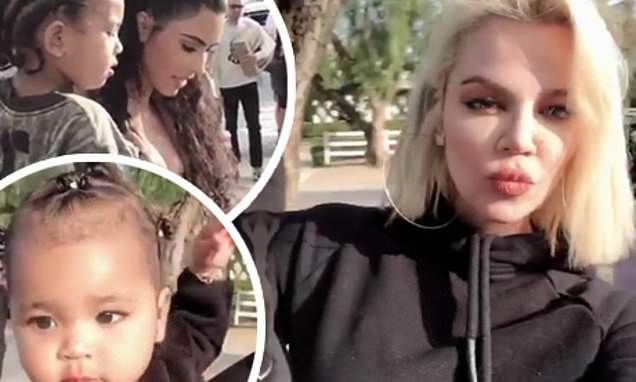 The 34-year-old Revenge Body star was seen having a playdate with her daughter True Thompson, who is nearly one-year-old, and Kim Kardashian's son Saint, aged three, near a park in Los Angeles. This comes after their ex-friend Jordyn Woods received tons of attention from fans as she flashed her chest when leaving an LA hot spot. Khloe wore a black top and let her shock blonde hair fall onto her shoulders as she held on to her baby girl Tristan Thompson, whom she had with basketball star Tristan Thompson. Kim was also in casual clothes as she was seen with two of her three kids she had with Kanye West; a fourth child is due soon. On Friday Woods looked overjoyed as she was showered with attention when leaving Craig's in West Hollywood. She was peppered with questions like if she had talked to Kylie Jenner, who she is no longer friends with, and if she has apologized to Khloe. Woods reportedly fooled around with Thompson in February during a house party, but the beauty told Jada Pinkett Smith on Red Table Talk that it wasn't more than a goodbye peck on the lips before she left his house at 7am. Khloe called her a liar on Twitter. The 11-month-old cutie rocked a floral headpiece and sweater after Khloe admitted online that her baby was 'worth' all of the struggles she's had to endure with ex-boyfriend Tristan Thompson.